This article details the enrichment of proteins associated with the synaptic plasma membrane by ultracentrifugation on a discontinuous sucrose gradient. The subsequent preparation of post-synaptic density proteins is also described. Protein preparations are suitable for western blotting or 2D DIGE analysis. Bermejo, M. K., Milenkovic, M., Salahpour, A., Ramsey, A. J. Preparation of Synaptic Plasma Membrane and Postsynaptic Density Proteins Using a Discontinuous Sucrose Gradient. J. Vis. Exp. (91), e51896, doi:10.3791/51896 (2014). Neuronal subcellular fractionation techniques allow the quantification of proteins that are trafficked to and from the synapse. As originally described in the late 1960’s, proteins associated with the synaptic plasma membrane can be isolated by ultracentrifugation on a sucrose density gradient. Once synaptic membranes are isolated, the macromolecular complex known as the post-synaptic density can be subsequently isolated due to its detergent insolubility. The techniques used to isolate synaptic plasma membranes and post-synaptic density proteins remain essentially the same after 40 years, and are widely used in current neuroscience research. This article details the fractionation of proteins associated with the synaptic plasma membrane and post-synaptic density using a discontinuous sucrose gradient. Resulting protein preparations are suitable for western blotting or 2D DIGE analysis. Neurons communicate through synapses, and the quality of this communication is regulated to a large extent by alterations in the composition of proteins at the synapse. In particular, the proteins located in the post-synaptic density participate in neuronal communication by intimately scaffolding neurotransmitter receptors with their signal transduction systems1. Furthermore, lasting changes in the strength of synaptic efficacy are controlled by the addition or removal of receptors at the post-synaptic density1-6. Therefore, the isolation and quantification of synaptic proteins is a necessary and useful technique to gain insight into the ways that neurons respond to stimuli and alter synaptic efficacy7. This article describes a common technique to isolate synaptic proteins from rodent brain tissue by ultracentrifugation on discontinuous sucrose gradients. The synaptic plasma membrane fraction can be enriched and isolated based on its density in sucrose, which has been empirically determined to be similar to 1.2 M sucrose. Depending on the biological question, subcellular fractions can be separated by continuous or discontinuous gradients of either sucrose or Percoll. Continuous gradients allow for the separation of proteins into multiple fractions; this can be particularly useful to demonstrate the co-localization of proteins within a given fraction8. However, the preparation of continuous gradients is more laborious and is unnecessary for many applications. Discontinuous gradients are comparatively easier to prepare and can be used to separate proteins into a few, generally-defined fractions. Discontinuous gradients that are composed of three sucrose layers of increasing molarity have been widely used to isolate proteins associated with the synaptic plasma membrane (SPM). This synaptic plasma membrane fraction can be further processed to the post-synaptic density fraction (PSD) by detergent treatment and isolation of the detergent-insoluble fraction. When this process was first described in the 1960’s9,10, electron microscopy was used to demonstrate the organelles and membranes that roughly define the synaptic plasma membrane and post-synaptic density fractions9-14. These studies demonstrated the inclusion of pre- and post-synaptic membranes and synaptic vesicles in the SPM fraction; after detergent treatment primarily the electron-dense, post-synaptic densities were visible. In the procedure, a hypotonic shock is used to pinch off the synaptic processes from the cell body10. This step takes advantage of the fact that mitochondria are more resistant to osmotic shock and remain intact, and so they sediment at the bottom of the sucrose gradient (Figure 1). Using this same enrichment technique, the SPM and PSD fractions were first biochemically defined by polyacrylamide gel electrophoresis and sequencing of the major protein components15-17. Subsequently western blot analysis has been used to detect and quantify the levels of synaptic proteins and further define these fractions (Figure 2). We have used this technique in our laboratories to quantify changes in the synaptic levels of the dopamine transporter that occur when the Slc6a3 locus is duplicated in mice18. We have also used this technique in NMDA receptor deficient mice to uncover synapse-specific reductions in proteins that are part of the DISC1 interactome19. It is evident from western blot analysis that SPM fractions contain synaptic vesicle membrane proteins, endosome markers, mitochondrial proteins, membrane associated synthetic enzymes and signal transduction molecules, as well as integral components of the post-synaptic density and synaptic plasma membranes20-23. Even PSD fractions can have contamination with abundant mitochondrial proteins and it may be necessary to perform a second gradient sedimentation or additional purification steps to remove them13. Recently, quantitative mass spectrometry has provided a list of over 100 proteins in the post-synaptic density alone, as well as an indication of the relative abundance of these components24,25. The following protocol conforms to the guidelines of the Canadian Council of Animal Care and has been approved by the Faculty of Medicine and Pharmacy Animal Care Committee at the University of Toronto. Add protease and phosphatase (if necessary) inhibitors to all sucrose solutions, buffers and ddH2O at concentrations outlined in Table 1. IMPORTANT: Perform all of the steps at 4 °C and pre-cool all of the reagents and equipment prior to the start of the experiment. Label all tubes, including ultracentrifuge tubes, with permanent marker. Sacrifice the animal by cervical dislocation or decapitation. House and euthanize animals in accordance with institutional and governmental policies on animal care. Rapidly remove the brain from the skull and place on an chilled dissection block. Dissect the appropriate brain region from fresh tissue and proceed to Step 3. Place 50-100 mg (for SPM), or 100-200 mg (for PSD) of the dissected tissue in a labeled 13 ml polypropylene tube containing 4 ml of 0.32 M HEPES-buffered sucrose solution. Transfer the sample to a 15 ml tapered glass-Teflon tissue grinder/homogenizer, set the motor drive to 900 rpm (setting 7) and homogenize the sample with 12 strokes over a 30 sec period. Use a different glass-Teflon homogenizer between samples, or rinse the homogenizer with cold distilled water between samples and wipe dry with a Kimwipe. NOTE: Up to 4 g of tissue can be homogenized in 4 ml of 0.32 M HEPES-buffered sucrose solution, however it is advisable to use less tissue to ensure proper fractionation. Transfer the homogenized sample back to the same 13 ml polypropylene tube. Reserve 100 μl of homogenate and store at -80 °C for subsequent protein quantification and western blot analysis of the total protein fraction. Centrifuge the homogenate in a fixed angle rotor at 900 x g for 10 min at 4 °C. Transfer the supernatant (S1) to a new, labeled 13 ml tube and resuspend the nuclear fraction pellet (P1) in 500 μl of 0.32 M HEPES-buffered sucrose. NOTE: The (P1) fraction can be stored at -80 °C and used for western blot analysis of the nuclear fraction. Centrifuge the supernatant (S1) at 10,000 x g for 15 min at 4 °C. Remove the supernatant (S2) and reserve 500 μl in a microcentrifuge tube to store at -80 °C for subsequent protein quantification and western blot analysis of the cytosolic/light membrane fraction. Resuspend the remaining crude synaptosomal fraction pellet (P2) in 1 ml of 0.32 M HEPES-buffered sucrose solution and then add another 3 ml of 0.32 M HEPES-buffered sucrose solution. Centrifuge at 10,000 x g for 15 min at 4 °C. 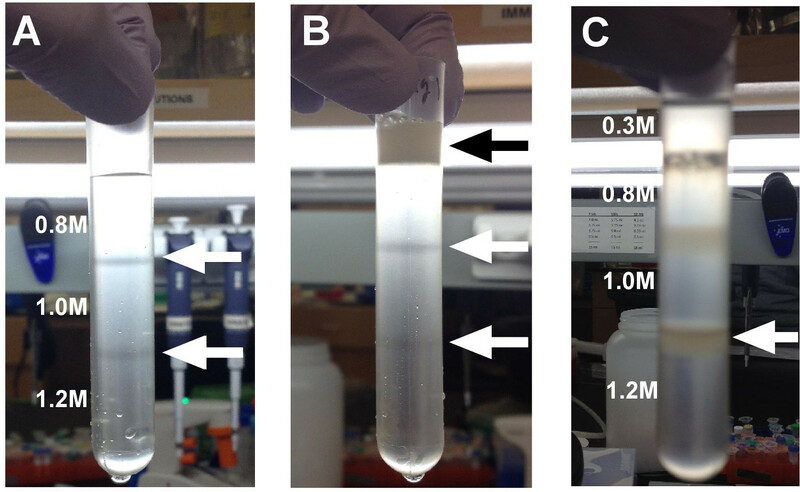 Remove the supernatant (S2’) and reserve 500 μl in a microcentrifuge tube to store at -80 °C for subsequent protein quantification and western blot analysis of the cytosolic/light membrane fraction. Save the washed crude synaptosomal pellet (P2’) in the polypropylene tube. Lyse the crude synaptosomal pellet (P2’) in the polypropylene tube by resuspending it in 1 ml of ddH2O. Add another 3 ml of ddH2O, transfer to a glass-Teflon tissue homogenizer, and homogenize by hand with 3 strokes. NOTE: It is important to perform this step as rapidly as possible and quickly proceed to step 6.2. Transfer samples from the homogenizer back into the same 13 ml polypropylene tube and rapidly adjust the sample back to 4 mM HEPES with 16 μl of 1 M HEPES solution, invert to mix. Rotate samples at 4 °C for 30 min to ensure complete lysing. Centrifuge at 25,000 x g for 20 min at 4 °C. Remove the crude vesicular fraction supernatant (S3) and reserve it in a 5 ml tube to store at -80 °C for subsequent protein quantification and western blot analysis. Resuspend the synaptosomal membrane fraction (P3) in 1 ml of 0.32 M HEPES-buffered sucrose solution. Pipet exactly 3.5 ml of 1.2 M HEPES-buffered sucrose solution and exactly 3.0 ml each of 1.0 M and 0.8 M HEPES-buffered sucrose solution into separate 6 ml snap cap tubes. NOTE: This is done to pre-measure the volumes of the buffers that are used to make the sucrose gradient. Exact measurement of the volumes is important to ensure that the resulting gradients will be balanced for ultracentrifugation. Using a glass Pasteur pipet and bulb, transfer 1.2 M HEPES-buffered sucrose solution to the 12 ml polyallomer ultracentrifuge tube. Carefully layer the 1.0 M HEPES-buffered sucrose solution on top of the 1.2 M HEPES-buffered sucrose solution. Finally, layer the 0.8 M HEPES-buffered sucrose solution on top of the 1.0 M HEPES-buffered sucrose solution. Use a fresh Pasteur pipet for each sucrose solution and take care not to disturb the sucrose gradient. Vibrations from a bench vortex or microcentrifuge will disturb the integrity of the gradient. Using a Pasteur pipet, layer the resuspended synaptosomal membrane fraction (P3) on top of the prepared discontinuous sucrose gradient. Ensure that the gradients are balanced by weighing them inside the bucket of the swinging bucket rotor. If the buckets are not balanced, use a P200 pipet to carefully add 0.32 M HEPES-buffered sucrose to the top of the gradient and balance the rotor buckets. Ultracentrifuge in a swinging bucket rotor at 150,000 x g for 2 hr at 4 °C. Carefully remove the sucrose gradients from the ultracentrifuge buckets. Using an 18 G needle and a 1 ml syringe, puncture the tube at the bottom of the 1.0 M / 1.2 M HEPES-buffered sucrose solution interphase and withdraw the synaptic plasma membrane layer (SPM). Make note of the volume that each SPM sample occupies in the 1 ml syringe. Place the collected SPM layer in 3.5 ml thick-wall ultracentrifuge tubes, add exactly 2.5 volumes of 4 mM HEPES to adjust the sucrose concentration from 1.2 M to 0.32 M. Once each sample has been adjusted to 0.32 M sucrose, balance the tubes with 0.32 M HEPES-buffered sucrose solution. Ultracentrifuge in a fixed angle rotor at 200,000 x g for 30 min at 4 °C. Remove and discard the supernatant. Resuspend the synaptic plasma membrane pellet (SPM) in 300 μl of 50 mM HEPES / 2 mM EDTA solution. Store samples at -80 °C until used for western blotting. Thaw SPM samples on ice. Make a solution of 0.54% Triton X-100 in 50 mM HEPES / 2 mM EDTA solution. Transfer samples to 3.5 ml thick-wall ultracentrifuge tubes and centrifuge samples at 32,000 x g for 20 min at 4 °C. Reserve the supernatant (Triton X-100 soluble fraction [TS]) and store at -80 °C. NOTE: At this stage, the pellet represents the “PSD-1T” fraction. A second treatment with detergent will produce a “PSD-2T” fraction. If a PSD-1T fraction is desired, proceed to step 10.6. To produce a PSD-2T fraction, resuspend the pellet in 3 ml of 0.5% Triton X-100 in 50 mM HEPES / 2 mM EDTA solution. Rotate samples for 15 min at 4 °C. Centrifuge samples at 32,000 x g for 20 min at 4 °C and proceed to step 10.6. Discard the supernatant and resuspend the postsynaptic (PSD) pellet in 50 mM HEPES / 2 mM EDTA solution. NOTE: The resuspension volume may depend on the size of the pellet; a volume of 50-75 μl is recommended. Because the PSD fraction is a detergent-insoluble fraction, it is often necessary to add 1-2 μl of 0.5% SDS to enable complete resuspension of protein. Store samples at -80 °C until used for western blotting. The preparation of the sucrose density gradient should result in a clear separation of the three molar solutions of sucrose (0.8, 1.0, and 1.2 M sucrose). See Figure 3A for an example of the gradient before the protein sample is added. If the gradient is prepared too much in advance, or if it is prepared on a bench surface with vibration from other equipment, the gradient will be compromised and proper separation will not be achieved. If a clear separation of the three solutions is not visible, it is advisable to make a new gradient before adding the protein sample. See Figure 3B for an example of the sucrose gradient when the protein sample is added (black arrow). Following the centrifugation, there should be clear bands of protein fractions at each interphase (0.32/0.8, 0.8/1.0, 1.0/1.2). In addition a pellet should be visible at the bottom of the tube. See Figure 3C for an example of the fraction bands after ultracentrifugation. If fractions are only diffusely present at the interphase, it is likely that the gradient was compromised and further processing is not advised. Western blotting of total, SPM and PSD1T protein samples from mouse striatum is demonstrated in Figure 2. The enrichment of synaptic proteins like GluR1, PSD95, and CaMKII, can be visualized by loading a constant amount of protein (10 μg) from total, SPM, and PSD fractions. Perisynaptic proteins like the dopamine transporter (DAT) are enriched in the SPM fraction, but are eliminated in subsequent detergent steps of the PSD enrichment process. To ensure equivalent loading, protein levels can be visualized on the western blot membrane by staining with Ponceau Red26. Antibody-based “loading controls” are often reported in the literature, but this may be a misnomer since synaptic proteins may be differentially regulated in experimental treatment groups. If an antibody-based “loading control” is desired, it is advisable to first determine equivalent protein loading by Ponceau staining, and then test several reference proteins to identify those that do not change in the different experimental groups. Figure 1. 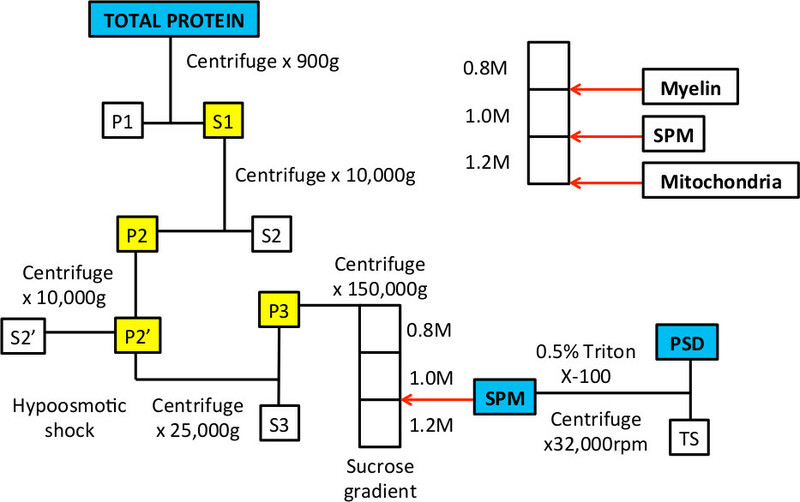 Workflow of subcellular fractionation to enrich SPM and PSD protein fractions. Figure 2. Representative western blot of total, SPM, and PSD1T protein from mouse striatum. 10 μg of protein extract were resolved on SDS-denaturing, 10% acrylamide gels, and transferred to PVDF membranes. 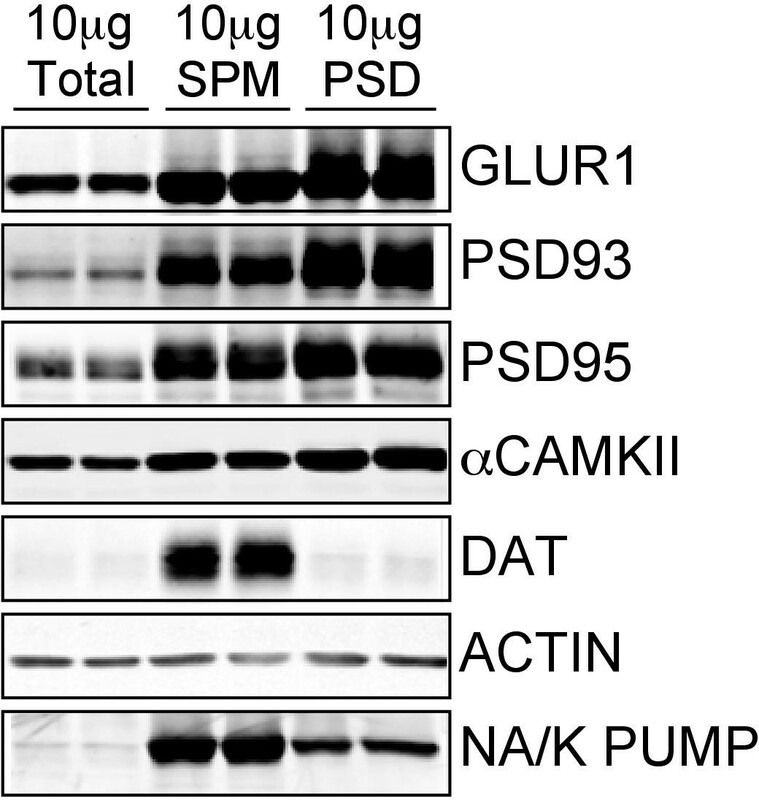 Subsequently these blots were incubated with primary antibodies for αCaMKII, GluR1, PSD-93, and PSD-95, which are all components of the post-synaptic density. Accordingly, these proteins are enriched in the SPM and PSD fractions. Alternately, blots were incubated with a primary antibody for DAT, which is located in presynaptic membranes in the striatum. While DAT is enriched in the SPM fraction, it is not part of the PSD complex, and immunoreactivity is not observed in the PSD fraction. Antibodies against actin or sodium/potassium ATPase (Na/K pump) can be used as loading controls, although some experimental conditions may affect the levels of these proteins as well and so the appropriate loading control must be determined empirically. Figure 3. Representative examples of sucrose gradient before and after ultracentrifugation. A. After the gradient is prepared, there should be three phases that are visible when the tube is held up to the light. The white arrows indicate the interphase between 0.8/1.0 M sucrose solutions and 1.0/1.2 M sucrose solutions. B. When the sample is loaded on top of the gradient, it is in a 0.32 M sucrose solution and will rest on top of the 0.8 M sucrose layer. C. After centrifugation, the homogenate will separate into several fractions. The fraction floating at the interphase of 0.8/1.0 M sucrose solutions will be enriched in myelin membranes. The fraction at the interphase of 1.0/1.2 M sucrose solutions represents the SPM fraction that is collected with a needle and syringe. The pellet at the bottom of the tube is enriched for mitochondrial proteins. There are several steps in the procedure that are critical for a successful outcome. In step 3, it is important that a consistent degree of homogenization is achieved for each sample. When homogenizing tissue with the motor driven homogenizer, a constant speed is used not only for the rotation of the pestle, but also with the number of strokes. The incubation time during the osmotic shock should be precise, since extended homogenization or incubation in the hypotonic solution will lyse mitochondria and contaminate the SPM sample. Another critical step is in the preparation of reagents, especially the sucrose solutions; if the molarity of the sucrose solution is incorrect the procedure will not work. Therefore, sucrose solutions should be prepared by weighing sucrose, dissolving in 4 mM HEPES solution then adding 4 mM HEPES to the precise final volume. Troubleshooting tip: build a test gradient with the prepared sucrose solutions to ensure that the gradient is properly assembled. Add varying concentrations of bromophenol blue (for example, final concentration of 0.005%-0.02% w/v) to the two of the three sucrose solutions to assist in the visualization of three distinct layers. It is important to limit the amount of time between when the gradient is assembled and when the tubes are centrifuged. Normal diffusion will destroy the gradient over time, and this is accelerated if there is vibration on the bench where the gradient is stored. Pre-pipetting of solutions into individual aliquots allows for precise volumes to be pipetted with a glass Pasteur pipet. This also decreases the time between gradient assembly and ultracentrifugation. Troubleshooting tip: build a “test gradient” with bromophenol blue dye as described above at the same time as the sucrose gradients for the experiment. The integrity of the gradient can thus be monitored over time. The test gradient will serve as an indicator of diffusion if the gradients are assembled too far in advance or are exposed to vibration. Finally, it is important to collect the SPM sample in as small a volume as possible, since it is necessary to subsequently dilute the sample with 2.5 volumes of water. Ideally the sample should be collected in a volume of 0.4-0.7 ml using a 1 cc syringe. It is advisable to build the discontinuous gradients during the final 20 min spin in step 7 to limit time between gradient assembly and ultracentrifugation. The protocol includes the recommendation to reserve all of the different fractions and store these at -80 °C for subsequent analysis. We have demonstrated the enrichment of post-synaptic proteins in Figure 2 in only a few of these fractions. However, it is advisable to measure the levels of a protein-of-interest in each of the fractions to understand its distribution. Comparing the distribution of a protein in the fractions with other subcellular marker proteins will also help to confirm that the experimental conditions have achieved the desired fractionation. Table 2 summarizes commonly-used protein markers that can be used as indicators for the stages of fractionation8,27-38. Utilization of the discontinuous sucrose gradient is widely used to enrich synaptic plasma membranes. This method has the advantage over continuous Percoll gradients in that discontinuous sucrose gradients are easier to make and do not require specialized equipment. However, this method may not be sufficient to precisely localize a protein of interest, and for these applications a Percoll gradient may be preferred. The authors thank Dr. Mike Ehlers and his laboratory members for originally demonstrating the protocol for subcellular fractionation of synaptic plasma membranes. We also thank Wendy Horsfall for management of the mouse colonies. This work was supported by operating grants from CIHR (AJR and AS). Delint-Ramirez, I., et al. In vivo composition of NMDA receptor signaling complexes differs between membrane subdomains and is modulated by PSD-95 and PSD-93. The Journal of Neuroscience : the Official Journal of the Society for Neuroscience. 30, 8162-8170 (2010). Wang, Q., et al. The psychiatric disease risk factors DISC1 and TNIK interact to regulate synapse composition and function. Mol Psychiatry. 16, (2010). Ehlers, M. D. Reinsertion or degradation of AMPA receptors determined by activity-dependent endocytic sorting. Neuron. 28, 511-525 (2000). Tomita, S., Fukata, M., Nicoll, R. A., Bredt, D. S. Dynamic interaction of stargazin-like TARPs with cycling AMPA receptors at synapses. Science. 303, 1508-1511 (2004). Ehlers, M. D., Heine, M., Groc, L., Lee, M. C., Choquet, D. Diffusional trapping of GluR1 AMPA receptors by input-specific synaptic activity. Neuron. 54, 447-460 (2007). Bats, C., Groc, L., Choquet, D. The interaction between Stargazin and PSD-95 regulates AMPA receptor surface trafficking. Neuron. 53, 719-734 (2007). Ehlers, M. D. Activity level controls postsynaptic composition and signaling via the ubiquitin-proteasome system. Nat Neurosci. 6, 231-242 (2003). Cartier, E. A., et al. A biochemical and functional protein complex involving dopamine synthesis and transport into synaptic vesicles. J Biol Chem. 285, 1957-1966 (2010). Rodriguez de Lores, A., Alberici, M., De Robertis, E. Ultrastructural and enzymic studies of cholinergic and non-cholinergic synaptic membranes isolated from brain cortex. Journal of Neurochemistry. 14, 215-225 (1967). Gray, E. G., Whittaker, V. P. The isolation of nerve endings from brain: an electron-microscopic study of cell fragments derived by homogenization and centrifugation. J Anat. 96, 79-88 (1962). Cotman, C. W., Taylor, D. Isolation and structural studies on synaptic complexes from rat brain. J Cell Biol. 55, 696-711 (1972). Cotman, C. W., Banker, G., Churchill, L., Taylor, D. Isolation of postsynaptic densities from rat brain. The Journal of Cell Biology. 63, 441-455 (1974). Carlin, R. K., Grab, D. J., Cohen, R. S., Siekevitz, P. Isolation and characterization of postsynaptic densities from various brain regions: enrichment of different types of postsynaptic densities. The Journal of Cell Biology. 86, 831-845 (1980). Jones, D. H., Matus, A. I. Isolation of synaptic plasma membrane from brain by combined flotation-sedimentation density gradient centrifugation. Biochim Biophys Acta. 356, 276-287 (1974). Kennedy, M. B., Bennett, M. K., Erondu, N. E. Biochemical and immunochemical evidence that the "major postsynaptic density protein" is a subunit of a calmodulin-dependent protein kinase. Proceedings of the National Academy of Sciences of the United States of America. 80, 7357-7361 (1983). Moon, I. S., Apperson, M. L., Kennedy, M. B. The major tyrosine-phosphorylated protein in the postsynaptic density fraction is N-methyl-D-aspartate receptor subunit 2B. Proceedings of the National Academy of Sciences of the United States of America. 91, 3954-3958 (1994). Cho, K. O., Hunt, C. A., Kennedy, M. B. The rat brain postsynaptic density fraction contains a homolog of the Drosophila discs-large tumor suppressor protein. Neuron. 9, 929-942 (1992). Salahpour, A., et al. Increased amphetamine-induced hyperactivity and reward in mice overexpressing the dopamine transporter. Proc Natl Acad Sci U S A. 105, 4405-4410 (2008). Ma, D. K., et al. Neuronal activity-induced Gadd45b promotes epigenetic DNA demethylation and adult neurogenesis. Science. 323, 1074-1077 (2009). Budreck, E. C., Scheiffele, P. Neuroligin-3 is a neuronal adhesion protein at GABAergic and glutamatergic synapses. The European Journal of Neuroscience. 26, 1738-1748 (2007). Wu, J., et al. Arc/Arg3.1 regulates an endosomal pathway essential for activity-dependent beta-amyloid generation. Cell. 147, 615-628 (2011). Huttner, W. B., Schiebler, W., Greengard, P., De Camilli, P. Synapsin I (protein I), a nerve terminal-specific phosphoprotein. III. Its association with synaptic vesicles studied in a highly purified synaptic vesicle preparation. J Cell Biol. 96, 1374-1388 (1983). Nagy, A., Baker, R. R., Morris, S. J., Whittaker, V. P. The preparation and characterization of synaptic vesicles of high purity. Brain Res. 109, 285-309 (1976). Cheng, D., et al. Relative and absolute quantification of postsynaptic density proteome isolated from rat forebrain and cerebellum. Molecular & Cellular Proteomics : MCP. 5, 1158-1170 (2006). Sheng, M., Hoogenraad, C. C. The postsynaptic architecture of excitatory synapses: a more quantitative view. Annu Rev Biochem. 76, 823-847 (2007). Sambrook, J., Fritsch, E. F., Maniatis, T. Molecular cloning : a Laboratory Manual. 2nd ed, Cold Spring Harbor Laboratory Press. (1989). Eggena, M., et al. Identification of histone H1 as a cognate antigen of the ulcerative colitis-associated marker antibody pANCA. J Autoimmun. 14, 83-97 (2000). Salahpour, A., et al. Homodimerization of the beta2-adrenergic receptor as a prerequisite for cell surface targeting. J Biol Chem. 279, 33390-33397 (2004). Bernocco, S., et al. Sequential detergent fractionation of primary neurons for proteomics studies. Proteomics. 8, 930-938 (2008). Grunewald, T. G., et al. Nuclear localization and cytosolic overexpression of LASP-1 correlates with tumor size and nodal-positivity of human breast carcinoma. BMC Cancer. 7, 198 (2007). Heimann, K., Percival, J. M., Weinberger, R., Gunning, P., Stow, J. L. Specific isoforms of actin-binding proteins on distinct populations of Golgi-derived vesicles. J Biol Chem. 274, 10743-10750 (1999). Neff, R. A. 3rd, Gomez-Varela, D., Fernandes, C. C., Berg, D. K. Postsynaptic scaffolds for nicotinic receptors on neurons. Acta Pharmacol Sin. 30, 694-701 (2009). Cella, N., Cornejo-Uribe, R. R., Montes, G. S., Hynes, N. E., Chammas, R. The lysosomal-associated membrane protein LAMP-1 is a novel differentiation marker for HC11 mouse mammary epithelial cells. Differentiation. 61, 113-120 (1996). Otera, H., et al. Peroxisomal targeting signal receptor Pex5p interacts with cargoes and import machinery components in a spatiotemporally differentiated manner: conserved Pex5p WXXXF/Y motifs are critical for matrix protein import. Mol Cell Biol. 22, 1639-1655 (2002). Goubaeva, F., et al. Cardiac mitochondrial connexin 43 regulates apoptosis. Biochem Biophys Res Commun. 352, 97-103 (2007). Lamers, K. J., et al. Protein S-100B, neuron-specific enolase (NSE), myelin basic protein (MBP) and glial fibrillary acidic protein (GFAP) in cerebrospinal fluid (CSF) and blood of neurological patients. Brain Res Bull. 61, 261-264 (2003). Arunachalam, L., et al. Munc18-1 is critical for plasma membrane localization of syntaxin1 but not of SNAP-25 in PC12 cells. Mol Biol Cell. 19, 722-734 (2008). Brandstatter, J. H., Fletcher, E. L., Garner, C. C., Gundelfinger, E. D., Wassle, H. Differential expression of the presynaptic cytomatrix protein bassoon among ribbon synapses in the mammalian retina. Eur J Neurosci. 11, 3683-3693 (1999).